Ultra-grip International Spring Pipe Chucks are heavy-duty large diameter through hole chucks with spring toggle clamping and pneumatic release, primarily used for turning threads on straight, bent, and/or upset pipe for the oil industry. Actuation Method – Spring Clamp and Pneumatic Release. Jaw Mount Serrations – Adjustable Angular Key (Optional 3/32” x 90° or 1.5mm x 60° serrations). Fast cycle time for maximum productivity. Spring clamp/pneumatic release provides the lowest maintenance, most dependable and safest chucking on the market today. Clamping force is completely adjustable to minimize distortion, providing secure clamping for maximum stock removal or light gripping for thin wall pipe. Sealed slides significantly reduce costly maintenance and resulting down time, increasing machine time, productivity and profits. Heavy duty low maintenance costs and long service life resulting in increased profitability. 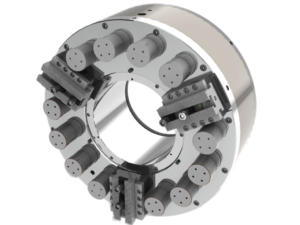 Common components across various chuck sizes allow for minimal inventory requirements. Centers work piece or compensates while using an external centering device.